The place where John’s body is buried is bathed in light. Literally. His grave is fully exposed to the rays of the sun from dawn to dusk. And when night falls, it basks in the lunar glow. For a couple hundred years John’s grave was sheltered by the dome of a magnificent basilica, but that church was leveled to the ground in a massive earthquake in the 7th century. And ever since, the white marble slab marking the place tradition holds is the resting place of the beloved disciple has been open to the elements—the breeze, the rain, and the rays of the Mediterranean sun. I think John would have liked it that way. I suspect he would have preferred the open air. He is, after all, the one who wrote: “God is light, and in him there is no darkness at all. If we say we have fellowship with him while we walk in the darkness, we lie and do not practice the truth. But if we walk in the light, as he is in the light, we have fellowship with one another…” (1 John 1:5-7). 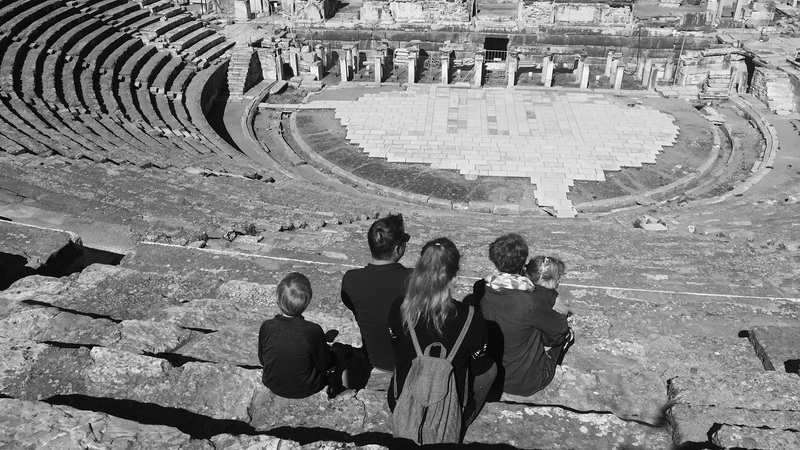 A month or so ago, our family stayed at a guest house right around the corner from the entrance to the site of the ruins of St. John’s Basilica in Selcuk, Turkey, the small town just down the road from the site of the ancient city of Ephesus. We wanted our kids to see the landscape where messengers carrying letters from Paul, John, and Peter hiked from one Roman city to another, the place where events from the chapters of Acts unfolded. It’s said that after John was released from his exile on Patmos, where he penned the fiery pages of Revelation, he returned to live in the area around Ephesus. There he wrote his gospel and many letters, three of which have been passed down to us in the New Testament. I’ve been reading 1 John this year. It’s the book I keep returning to, the book I’m trying to let shape my thoughts and the attitude of my heart. So, we came to see John’s haunts—the places he lived and wrote and was laid to rest. Standing on the top of Ayosolug Hill, where John is buried, we stood on a terrace overlooking the plain below Ephesus, flat land that was once the sea. Over the years the harbor that enriched the city silted up so that the waterway was transformed into farmland. I turned around to see my son balancing on an overturned marble column situated in a garland of blood red poppies. Centuries ago the place he was climbing would have been in the interior of the church. He hopped off one ruin then climbed up on another, pausing to rest before resuming his search for interesting stones and lizards hiding in the cracks. I suspect John would have cared less about the opulence of the basilica dedicated to him, than about the quality of the fellowship that took place under its glittering golden dome. Because the physical structures we build may not last; but our words, our relationships, the light to which we witness becomes our true legacy. I wonder if he would have found it amusing that the site of his tomb now feels forlorn, haphazardly groomed, only a lonesome rope swinging in the breeze to keep visitors from accidentally walking right over the surface his grave. John’s no longer there, even if his bones remain. In his first letter, it’s interesting that John repeatedly emphasizes doing the will of God, not just believing the word of God. Both are essential to spiritual vitality, but these days it’s not unusual in some Christian circles for the importance of living the truth to be obscured by sole emphasis on believing the truth. In John’s first letter, the two can’t be separated. His advice to those living in what he characterized as “the last hour” is to let the confession of faith in the Son of God abide in us. Which is to say, our belief has implications for the way we live, the way we act, and the way we treat one another. According to John, there is no mark more distinctive of a follower of Jesus than love. The call to love is the leitmotif of his letter, the theme to which he repeatedly returns. “For this is the message that you have heard from the beginning,” he claims, “that we should love one another” (3:11). It is by loving that we abide in Christ. It is by loving that we come to know God. “Beloved,” he exhorts, “let us love one another, for love is from God, and whoever loves has been born of God and knows God. Anyone who does not love does not know God, because God is love” (4:7-8). Love, John says, is the fountain from which spiritual insight and discernment into the character of God flows. He suggests that it is not even possible to know God apart from love. And he explains that God, himself, showed us what his love looks like by sending Jesus to live among us. Divine love abiding in us, flowing through us, manifest in us—this, John says, is the character of those who have found life in Christ. And this love is not an abstraction. It finds concrete expression in the way we treat those we’re related to in the family of the faith. Love should be the fruit of our confession, demonstrating whether or not a statement of belief is genuine. Lack of love, says John, betrays an anemic faith or is a sign of having no faith at all: “If anyone says, ‘I love God,’ and hates his brother, he is a liar; for he who does not love his brother whom he has seen cannot love God whom he has seen. And this commandment we have from him: whoever loves God must also love his brothers and sisters” (4:20-21). Christianity is not just a set of abstract ideas and beliefs, it necessarily encompasses a series of events that unfolded in real places and involved real people who struggled to love the people in their church and in their community. We went to Ephesus because we wanted our kids to walk on the Roman roads that would have been familiar to the early apostles. We wanted them to climb down into the agora, the market where Paul would have bought olive oil, bread and cheese for his dinner, or where Priscila and Aquila might have stocked up on fabric for their tent making business. We wanted to sit together on the carved stone steps of the amphitheater and imagine the riot instigated by the silversmiths furious that the upstart Christians were cutting into the trade in idols of Artemis and envision the bravery of Aristarchus who held firm to his faith even in the clutches of a raging mob. The amphitheater in Ephesus where the silversmiths started a riot. The words of scripture take on another dimension when we experience them in the contexts in which they were originally meant to be read. In light of the emphasis on love in John’s letter, it’s particularly interesting that in the letter to the church in Ephesus in Revelation, the issue at hand was the loss of love. While the members of the church of Ephesus were praised for their endurance, theological integrity, and the ability to discern between true and false apostles, the Lord sent them a strong warning: “But I have this against you, that you have abandoned the love you had at first. Remember therefore from where you have fallen; repent, and do the works you did at first. If not, I will come to you and remove your lampstand from its place” (Rev. 2:4-5). When I woke up in Ephesus and read these words, I realized there’s a lot of Ephesus in me. In my pursuit of truth have I lost my love? In my self-righteous judgment of brothers and sisters, have I forgotten how to bless, do good, humbly serve? I know for certain I haven’t always loved with the expansive love of God, a self-sacrificial love offered even to enemies. I have a burning sense that the warning to the church in Ephesus applies to me. Maybe it speaks to you too. May we never abandon our first love. May it be our strength and our song, the hallmark by which we are known. May the love of the Lord abide in us so that its fruit becomes an indelible sign of our connection to our Savior who first loved us. Tina, great article and beautiful pictures. Great insights- looking forward to your book! Thank you, Kie! Wonderful to hear from you. Have been to Ephesus twice, but your eye and heart uncovered more truth for me! Thank you for using the gifts God has given you to communicate what we the church need to hear! Oh that we might walk in that same light of love! So good to hear your thoughts and have a window into your heart during this time of (what I can only imagine) crazy transition. You are deeply loved and seen. Love, love, love you. To be seen is to be loved. Thank you, friend. Can’t wait to see you in the not too distant future. Thank you for sharing your heart and authentic spirit in your reflections on 1 John and your travels. So often we allow the busyness of life to consume us and draw us away from Papa. Your post is an encouragement to me in this time in life when I am striving to draw near to our Papa and walk in faithful obedience to His call in on and plan for my life. So true, Kathryn! Busyness often does consume us. It’s an issue for me too. It takes so much discipline to pause and rest in God’s presence. So glad these thoughts on John spoke to you. May you abound in hope, friend!